Temple Bar was the principal ceremonial entrance to the City of London on its western side from the City of Westminster. It is situated on the historic royal ceremonial route from the Tower of London to the Palace of Westminster, the two chief residences of the mediaeval English monarchs, and from the Palace of Westminster to St Paul's Cathedral. The road east of Temple Bar and within the City is Fleet Street, the road to the west, in Westminster, is The Strand. 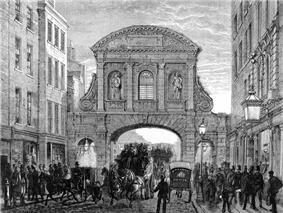 At Temple Bar the Corporation of the City of London formerly erected a barrier to regulate trade into the City. The 19th century Royal Courts of Justice are located next to it on its north side, having been moved from Westminster Hall. To its south is the Temple Church and the Inner Temple and Middle Temple Inns of Court. As the most important entrance to the City of London from Westminster, it was formerly long the custom for the monarch to halt at Temple Bar before entering the City of London, in order for the Lord Mayor to offer up the Corporation's pearl-encrusted Sword of State as a token of loyalty. The term Temple Bar strictly refers to a notional bar or barrier across the route, but is commonly used to refer to the 17th century ornamental Baroque arched gateway designed by Christopher Wren which spanned the road until its removal in 1878. 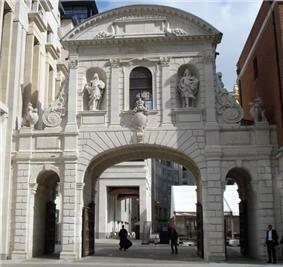 Wren's arch was preserved and was re-erected in 2004 in the City, in Paternoster Square next to St Paul's Cathedral. "The Temple Bar ceremony, which is still occasionally re-enacted at a monument to the Bar, involves the monarch stopping to request permission to enter the City and the Lord Mayor presenting the Sword of State as a sign of loyalty." However the popular belief that the monarch requires the Lord Mayor's permission to enter the City is incorrect. A bar is first mentioned in 1293 and was probably only a chain or bar between a row of posts. More substantial structures with arches followed. After the Battle of Evesham of 1265, Prince Edward punished the rebellious Londoners, who had befriended Montfort, by taking away all their street chains and bars, and storing them in the Tower of London. By 1351, a wooden archway had been built housing a small prison above it. The earliest known documentary and historical notice of Temple Bar is in 1327, concerning a hearing before the mayor regarding a right of way in the area. In 1384 Richard II granted a licence for paving the Strand Street from Temple Bar to the Savoy, and collecting tolls to cover the expense. On the 5th of November, 1422, the corpse of Henry V was borne to Westminster Abbey by the chief citizens and nobles, and every doorway from Southwark to Temple Bar had a torch-bearer. In 1503 the hearse of Elizabeth of York, queen of Henry VII, halted at Temple Bar, on its way from the Tower to Westminster, and at the Bar the Abbots of Westminster and Bermondsey blessed the corpse, and the Earl of Derby and a large company of nobles joined the funeral procession. Anne Boleyn passed through the Bar on May 31, 1534, the day before her coronation, on her way to the Tower. On that occasion Temple Bar was new painted and repaired, and near it stood singing men and children—the Fleet Street conduit all the time running claret. In 1544 Thomas Wyatt led an uprising in opposition to Queen Mary I's proposed marriage to Philip II of Spain. When he had fought his way down Piccadilly to The Strand, Temple Bar was thrown open to him, or forced open by him; but when he had been repulsed at Ludgate he was hemmed in by cavalry at Temple Bar, where he surrendered. This revolt persuaded the government to go through with the verdict against Lady Jane Grey. Although it escaped damage by the Great Fire of London of 1666, it was rebuilt as part of the general improvement works made throughout the City after that devastating event. Commissioned by King Charles II, and attributed to Sir Christopher Wren, the fine arch of Portland stone was constructed between 1669 and 1672, by Thomas Knight, the City Mason, and Joshua Marshall, Master of the Mason's Company. The statues of Elizabeth I, James l, Charles I, and Charles II, in niches in the upper floor were carved by John Bushnell. Bishopsgate and Aldgate) had all been demolished by 1800, but Temple Bar remained despite its impediment to the ever-growing traffic. The upper story room was leased to the neighbouring banking house of Child & Co for storage of records. In the 1853 Bleak House, Charles Dickens described it as "that leaden-headed old obstruction, appropriate ornament for the threshold of a leaden-headed old corporation". It was also the subject of jokes, "Why is Temple Bar like a lady's veil? Both must be raised (razed) for "busses". It was noted in jest "as a weak spot in our defenses", since one could walk through the adjoining barbershop where one door opened on to the City and the other in the area of Westminster. In 1874 it was discovered that the keystones had dropped and the arches were propped up with timbers. The steady increase in horse and cart traffic led to complaints that Temple Bar was becoming a bottleneck, holding back the City trade. In 1878 the City of London Corporation, eager to widen the road but unwilling to destroy so historic a monument, dismantled it piece-by-piece over an 11-day period and stored its 2,700 stones carefully. 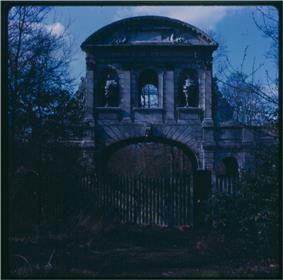 In 1880 the brewer Henry Meux, at the instigation of his wife Valerie Susan Meux, bought the stones and re-erected the arch as the facade of a new gatehouse in the park of his mansion house Theobalds Park in Hertfordshire, the site of a former hunting lodge of James VI and I There it remained, positioned in a woodland clearing, from 1878 to 2003. A placque marks the site where Temple Bar once stood. In March 1938 Theobalds Park was sold by Sir Hedworth Meux to Middlesex County Council, but the Temple Bar Gatehouse was excluded from the sale and retained by the Meux trustees. In 1984 it was purchased by the Temple Bar Trust from the Meux Trust for the sum of £1. In December 2001 the City's Court of Common Council resolved to contribute funds for the return of Temple Bar to the City. On 13 October 2003 the first stone was dismantled at Theobalds Park and all were placed on 500 pallets for storage. In 2004 it was returned to within the City of London where it was painstakingly re-erected as an entrance to the Paternoster Square redevelopment immediately north of St Paul's Cathedral, which opened to the public on 10 November 2004. The total cost of the project was over £3 million, funded mainly by the City of London, with donations from the Temple Bar Trust and several City Livery Companies. The top of one of the gates was offered for sale by Dreweatts Auctioneers in a London sale of surplus stock from LASSCO on 15 June 2013. Horace Jones' Temple Bar marker topped by Charles Bell Birch's heraldic Dragon. Following the demolition of Wren's gateway, Horace Jones, Architect and Surveyor to the City of London, designed a memorial to mark Temple Bar which was unveiled in 1880. The Temple Bar Memorial stands in front of the Royal Courts of Justice. The elaborate pedestal in a Neo-Renaissance style serves as the base for a sculpture by Charles Bell Birch commonly called the Griffin (in fact a dragon), in reference to the heraldic crest of the Corporation of the City of London. The pedestal is decorated with statues by Joseph Boehm of Queen Victoria and her son The Prince of Wales, the last royals to have entered the City through Wren's gate, which event is depicted in one of the reliefs which also decorate the structure. The Dragon on top of Temple Bar comes to life in Charlie Fletcher's children's book about unLondon, Stoneheart. Charles Dickens mentioned Temple Bar in A Tale of Two Cities (Book II, Chapter I), noting its proximity to the fictional Tellson's Bank on Fleet Street. This was in fact Child & Co. which used the upper rooms of Temple Bar as storage space. Whilst critiquing the moral poverty of late-18th century London, Dickens wrote that in matters of crime and punishment, "putting to death was a recipe much in vogue," and illustrated the horror caused by severed heads "exposed on Temple Bar with an insensate brutality and ferocity..."
The dragon also features in Virginia Woolf's The Years, in which one of the main characters, Martin, points "at the splayed-out figure at Temple Bar; it looked as ridiculous as usual – something between a serpent and a fowl." ^ Details and photos at Victorian Web.